If you’re only missing one or two teeth, you may not want to have a partial denture that can damage the teeth it’s clipped onto. Instead, a bridge can be placed that stays in position and doesn’t need to be removed. 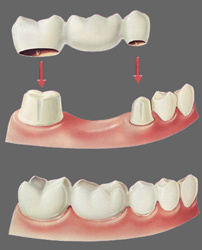 It looks like a typical row of teeth, with the regular function of your natural smile. Because it can be difficult to clean bridges, we may recommend that you return for a follow-up appointment to learn how to clean them properly. We’ll also get you scheduled for our recall list, making sure your bridge stays in great shape with regular six-month checkups.